The Festive mood is still not over! Before I left for Dubai, I was literally going mad with all the baking and challenges to complete. Cookies, cakes, muffins, breads…. the list is endless. I don’t thing I have done so much baking in such a short period. Back from my holiday and now I have too many recipes to blog! Maybe some will disappear in my file as the year has begun with too many things to do. However, everyone around is still in a festive mood, Christmas decors still hanging everywhere, people in holiday mood and celebrations still going on. But tomorrow is going to a different scenario, with people going back to work, children back to school and everyone will be ready to face a new year with all its challenges. 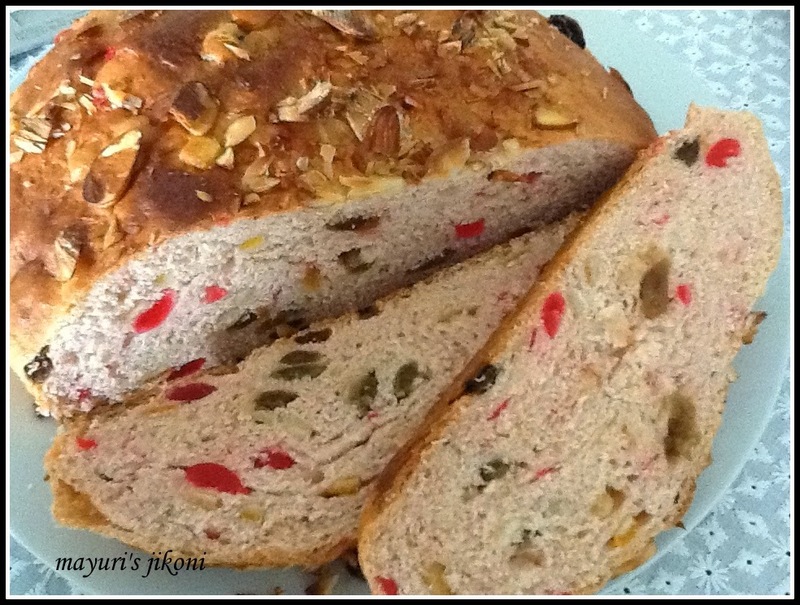 For the month of December, Aparna (My Diverse Kitchen) challenged the We Knead to Bake group with a Norwegian Christmas bread, Julekake or Julekaga dotted with colourful candied citron, dried fruit and scented with cardamom. Dusted with powdered sugar or glaced with glace icing, the bread is usually served for breakfast. We loved the bread with flavours of cardamom, raisins, candied peels and cherries. A true festive taste and feeling. Toasted the left over bread the next day and it tasted heavenly with butter melting on it. Pure indulgence. I baked it eggless. It turned out soft, cake like texture and with just the right amount of sweetness. Has your new year begun with a list full of ‘to do’ things? Mine has. Sieve the flour, cardamom powder and salt together into a big bowl. Knead the dough till it is soft, elastic and smooth, for about 7-10 minutes if using your hands. Add the dried fruits and peels. Knead it into the dough. Cover the dough with a cling film and keep it in a warm place till it becomes double the size. Mine took about 1½ hours. Gently knead the dough. Let it rest for 10 minutes. Shape it into a round ball. Place it on a greased baking tray or in a baking tin. Cover the dough with a tea towel and let it rise again in a warm place for 45-60 minutes. Brush the top with milk and sprinkle almonds or sugar pearls on top. Bake for 30 minutes till the top is golden brown. If it begins to turn brown too quickly, cover the top with a piece of aluminium foil. Remove the bread from the oven. Remove it from the tin or baking tray and let it cool on a wire rack. If you are going to glace the bread, wait till it is cool. Pour the glace icing over it and serve. If you like, add an egg to the dough. You can brush the top with lightly beaten egg instead of milk. *If you are going to glace the bread with glace icing, then do not add sugar pearls or crushed sugar cubes on top. Also reduce the amount of sugar in the dough. Candied citron is an important ingredient in this bread. It is not the same as the candied fruit available in the stores in India. I will add a bit more cardamom powder next time round. You can bake it in a loaf tin if you like. I shaped mine into a round ball and baked it in a cake tin. Amount of milk required will depend on the quality of flour. If you are adding an egg, less milk will be required. I would like to wish all of you a very happy new year. May this new year bring you happiness, peace, good health and precious moments with loved ones. Very nice recipe of the bread with cherries. Mayuri, I came to Mombasa long time ago and stayed in a big temple near elephant tusks road. Please remind me the name of the temple. This bread looks lovely. I too have a whole list of things to blog about already!